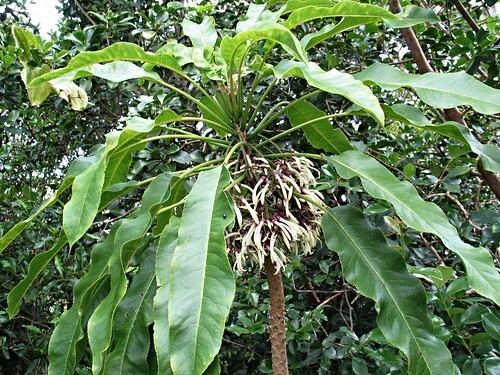 Cyanea is an endemic genus of some 80 species with new species still being discovered. Leaves of this species (Cyanea angustifolia) as well as ʻakuʻaku (Cyanea platyphylla), now endangered, were wrapped in ti (kī) leaves, cooked in an ʻimu and eaten in times of food scarcity by early Hawaiians. The generic name Cyanea is from the Greek, cyaneos, blue, referring to the supposedly blue flowers of the type species, Cyanea grimesiana, which in reality are white or to purplish. The specific name angustifolia [angustifolius] means "narrow leaved."